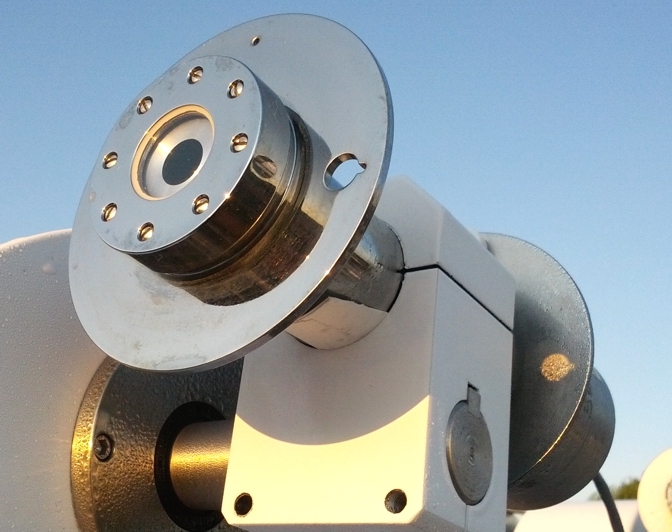 A pyrheliometer mounted on a solar tracker is used to measure the Direct Beam Solar Irradiance (DNI) from the sun. Historically, the preferred field of view for Pyrheliometers was based on a 10:1 ratio which equated to approximately 5.7°. Due in part to the commercialization of the Eppley AHF Cavity Radiometer as a Primary Standard and advances in accuracy of Automatic Solar Trackers (such as the Eppley SMT Tracker), the preferred FOV for pyrheliometers is now 5º. The new Eppley sNIP has a 5° FOV. In fact, it has the exact same geometric dimensions as used in the AHF. Additionally, internal changes were employed to increase the response time and reduce conduction and convection issues and a thermistor is included for those who wish to measure the instrument temperature. *To officially be considered a Secondary Standard, the pyrheliometer in question must be calibrated with WRR traceability through a Primary Standard Pyrheliometer such as the Eppley AHF Cavity Radiometer. EPLAB Calibrations are typically performed against a Secondary Standard Pyrheliometer. At the customer’s request and for an additional fee, this calibration can be performed against our WRR traceable AHF Cavity Radiometer. Please contact Eppley for additional information. ** There has been much discussion on “uncertainty” and how it pertains to solar measurements. The RSS of the 9060 specifications results in an uncertainty of approximately 1.5%. The typical uncertainty of Eppley’s factory calibrations are less than 1%. The stated uncertainty of the WRR is 0.4%. Evidence from direct comparisons of sNIP to AHF show the sNIP is capable of hourly averages better than 2% and daily averages better than 1% (assuming proper tracking and clean windows).